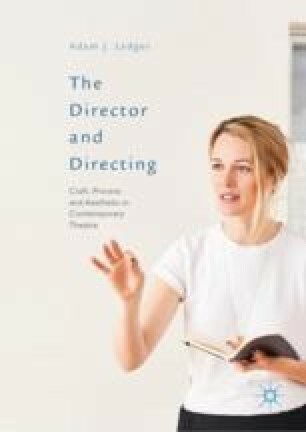 The Introduction outlines the aims and scope of the book, and draws upon and critiques extant writings to situate the figure of the director in an historical, artistic and contemporary context. Following two anecdotes about the directors Boris Yukhananov and Yukio Ninagawa, it introduces neuroaesthetics as an original means to assess directing and argues for performance as an ‘event’, embracing Peter M. Boenisch’s assessment of ‘theatrality’ and Patrice Pavis’s treatment of mise en scène. Theories of creative process are allied to neuroaesthetic theory as offered through key writings by Semir Zeki and G. Gabrielle Starr. Finally, the position of the scholar in relation to the observation of rehearsal and when writing about living theatre-makers is assessed.